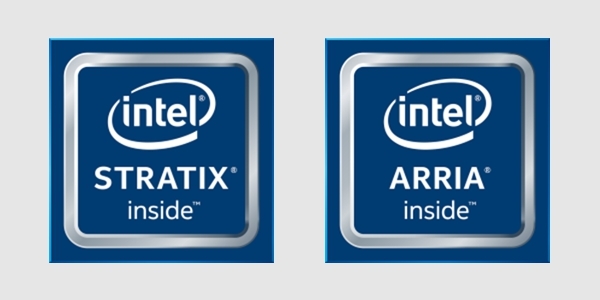 Previously Altera, Intel's 28 nm Stratix® V FPGAs deliver the high bandwidth, high level of system integration, and ultimate flexibility for high-end applications. The EDT PCIe8g3 A5-10G supports PCI Express – PCIe, Gen3 - x8 and has two 10G SFP+ and 1 – 10 GbE or OC3/12/48/192 (STM1/4/16/64), or OTU1/2/2e/2f. This low-profile board is available as a half-height or full-height backpanel. The port links to the SERDES user-interface for serialization and deserialization, and clock recovery and its own 1 – 808 MHz programmable reference clock. The EDT PCIe8g3 A5-40G supports PCI Express – PCIe, Gen3 - x8 and has a 40G QSFP+ and 40 GbE or OTU3. The board is available as half-height or full-height. The port links to the SERDES user-interface for serialization and deserialization, and clock recovery and its own 1 – 808 MHz programmable reference clock. The EDT PCIe8g3 S5-10G supports PCI Express – PCIe, Gen3 - x8 and has four 10G SFP+ and 1 – 10 GbE or OC3/12/48/192 (STM1/4/16/64), or OTU1/2/2e/2f. The ports link to the SERDES user-interface for serialization and deserialization, and clock recovery and its own 10 – 210 MHz programmable reference clock. The EDT PCIe8g3 S5-40G supports PCI Express – PCIe, Gen3 - x8 and has one 40G QSFP+ and supports 1/10/40 GbE, OC3/12/48/192 (STM1/4/16/64), or OTU1/2/2e/2f. The ports link to the SERDES user-interface for serialization and deserialization, and clock recovery and its own 10 – 210 MHz programmable reference clock. The EDT PCIe4 CDa is a PCI Express 4-lane interface that enables fast DMA and synchronous I/O to transfer differential data between an external device and a host computer, LVDS or RS422. FPGA is Altera Arria II GX (EP2AGX45D) combining PCIe DMA at 700 Mbs with UI functionality at 150 Mbs I/O, which is via integrated FIFO buffers. The EDT ECL / LVDS-E / RS-422-E is a mezzanine board that pairs with an EDT main board for PCI Express for high-speed data transfer. This “E-series” board options are ECL, LVDS or RS-422 inputs and outputs in groups of four, with an E1/T1 option. EDT Bridge, Backpanel, and Time Boards attache to EDT main boards. In a NIC mechanical form factor, the BittWare 385 – Altera Stratix V A7 is a network-enabled FPGA card with two SFP+ 10 GbE ports and 8 GB DDR3 SDRAM. Typical applications are ≤ 25 W.
In a NIC mechanical form factor, the BittWare 385 – Altera Stratix V D5 is a network-enabled FPGA card with two SFP+ 10GbE ports and 8GB DDR3 SDRAM. Typical applications are ≤ 25 W.
The Stratix V AB is the largest Altera FPGA, delivering maximum performance. In a GPU mechanical form factor, the BittWare 395 – Altera Stratix V AB is a network-enabled FPGA card with four SFP+ ports with clock/data recovery support numerous protocols and speeds. The Stratix V D8 is the largest Altera FPGA, delivering ultimate performance. In a GPU mechanical form factor, the BittWare 395 – Altera Stratix V D8 is a network-enabled FPGA card with four SFP+ ports with clock/data recovery and support for numerous protocols and speeds. BittWare's S5PE-DS is a PCIe x16 card featuring two high-bandwidth, power-efficient Altera Stratix V GX or GS FPGAs. Designed for high-end applications, the Stratix V provides a high level of system integration and flexibility for I/O, routing, and processing. BittWare's S5PCIe-HQ (S5PH-Q) is a half-length PCIe x8 card based on the high-bandwidth, power-efficient Altera Stratix V GX or GS FPGA. Designed for high-end applications, the Stratix V provides a high level of system integration and flexibility for I/O, routing, and processing. BittWare’s S5-PCIe-F (S5PE-F) is a PCIe x8 card based on the high-bandwidth, power-efficient Intel Stratix V GX/GS FPGA. Designed for high-end applications, the Stratix V provides a high level of system integration and flexibility for I/O, routing, and processing. BittWare’s S5-6U-VPX (S56X) is a rugged 6U VPX card based on the high-bandwidth, power-efficient Intel Stratix V GX/GS FPGA. Designed for high-end applications, the Stratix V provides a high level of system integration and flexibility for I/O, routing, and processing. BittWare's A5-PCIe-L (A5PL) is a low-profile PCIe x8 card based on the Intel Arria V GZ FPGA. The high-performance, power- and cost-efficient Arria V GZ provides a high level of system integration and flexibility for I/O, routing, and processing. BittWare's A5-PCIe-S (A5PS) is a low-profile PCIe x8 card based on the Intel Arria V GZ FPGA. The high-performance, power- and cost-efficient Arria V GZ provides a high level of system integration and flexibility for I/O, routing, and processing. Based on Altera’s Stratix IV GX FPGA, BittWare’s 4S-XMC (4SXM) is a single-width XMC, designed to provide powerful FPGA processing and high-speed serial I/O capabilities to VME, VXS, VPX, cPCI, AdvancedTCA, or PCI Express carrier boards. BittWare’s S4-3U-VPX (S43X) is a commercial or rugged 3U VPX card based on the high-density, low-power Altera Stratix IV GX FPGA. The Stratix IV GX is designed specifically for serial I/O-based applications, creating a completely flexible, reconfigurable VPX board. Based on Altera’s Stratix IV GX FPGA, BittWare’s S4-AMC (S4AM) is a mid- or full-size, single wide AdvancedMC that can be attached to AdvancedTCA carriers or other cards equipped with AMC bays, and used in MicroTCA systems. BittWare’s D4-AMC (D4AM) features the I/O processing power of two Altera Stratix IV FPGAs. The D4AM is a mid- or full-size, single wide AdvancedMC that can be attached to AdvancedTCA carriers or other cards equipped with AMC bays, and used in MicroTCA systems.